Graphic Event Planners - London, Ontario. Grafica’s superior design team selects only the finest products and décor items from over 500 suppliers worldwide to provide you with high artistic quality, coupled with a sense of value. From public lobbies to private homes, Grafica’s creativity is endless and can enhance and complement any space. Let Grafica make every season special with innovative decorations or ageless traditions to suit your event. Grafica can customize the existing décor by adding pieces to enhance your event or begin decorating from the very beginning. 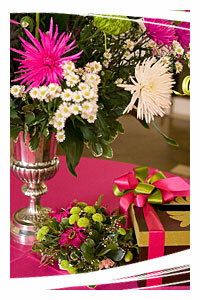 Grafica uses the most discriminating taste when selecting flowers for your event. Our arrangements feature some of the most unique and vibrant flowers pulled from resources around the world. Lead by experienced designer Jim Telfer, Grafica’s in-house Floral Department stands tall in the event industry. Creativity is key at Grafica so whether you’re looking for a market display of cut flowers, fresh vegetables, or a tiered fountain teeming with cascading greens, the artistry of Grafica’s designs will amaze you!